Silk Mountain Creations is your source for Hunter Douglas Window Coverings and other custom soft furnishings for your home and office. We are Hunter Douglas Priority Dealer with samples of many of the fine products fabricated by Hunter Douglas. All Hunter Douglas products are designed and made in the United States. 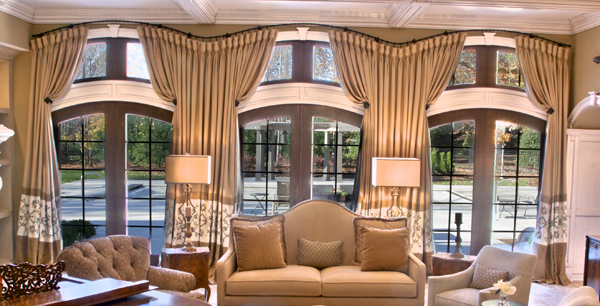 We have been in the custom window treatment business serving designers and private clients since 2001. We offer expert consultation, design, fabrication and installation of all window treatments and soft furnishings such as pillows, cushions, bedding, custom headboards, shades and more. We are professionally trained, not merely observers of window treatments, and the work is performed in our shop. We recognize that quality is in the details such as expert craftsmanship, pattern placement and proportion. We provide excellence. In addition, we offer custom designer hardware from a number of the leading sources in the United States. We have samples and color palettes available in our showroom. We are members of the Window Covering Association of American and the Workroom Association of America and follow the guidelines set forth for quality workmanship and business ethics. We are also active members of national workroom forums of the Custom Home Furnishings Academy and the WAOA learning and sharing with peers in this business.